Everyone loves taking their wedding photos are Brooklyn Bridge Park in Brooklyn New York. And who wouldn't want to see a bride and groom with the Manhattan skyline in the background? The only hard part about bridal party pictures here is that it gets crowded. You really have to make sure your backgrounds are clean. But every so often you can capture a spontaneous moment. 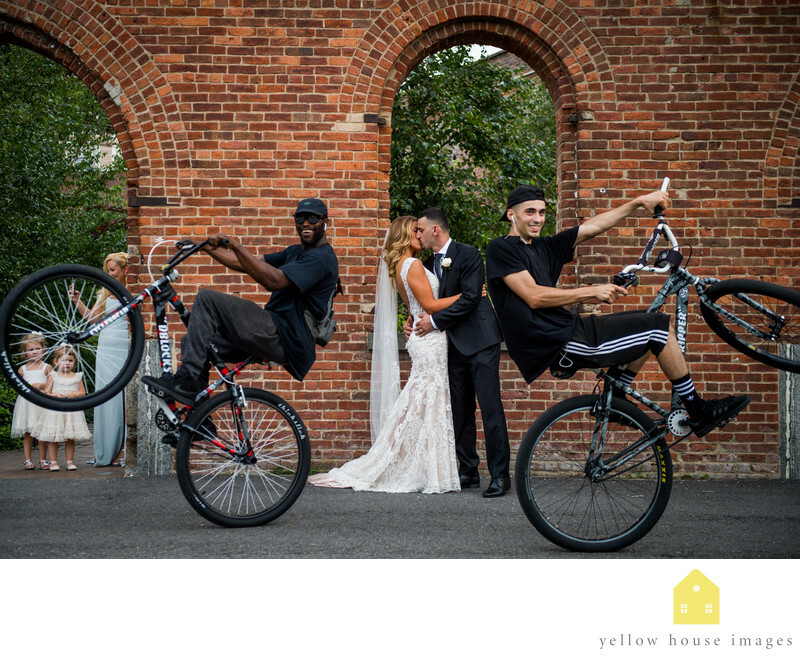 Here I noticed two bike riders were having fun driving by while the bride and groom were kissing. I used this opportunity to take out snap some shots with m Nikon D5 and 105mm 1.4 lens.A fast shutter help capture the moment as both bikes crossed and left the bride and groom in the middle. This photo is a good example of how you always need to be on your toes and shooting a lot when shooting like a photojournalist. We did manage to get all the shots the bride wanted. We got Cobblestone streets, the manhattan bridge, the Brooklyn carousel, and many more. But this spontaneous moment sticks out as being a fun wedding photo moment. Location: 334 Furman St, Brooklyn, NY 11201.